If you can read this, then no. 1.) Try the standard routine for troubleshooting. 2.) Try a different browser for a while. If the problem goes away, it's probably a setting or issue with your primary browser. 3.) Try disabling any browser add-ons or Greasemonkey scripts. If the problem goes away it's probably something modifying the page in a way that breaks things. 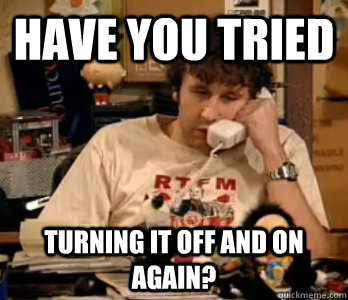 Am I the only one who kind of hoped pb's link to the standard troubleshooting routine was just this jpeg? Spurious datapoint: I've had two instances in the last two days of going to MetaFilter and getting some version of "server not found", once on an iPad and once on my computer. Hasn't happened with any other site. I just moved to a new apartment and assume it has something to do with the new internet connection. It's testing fine for me in Firefox 37.0.1 and Chrome 41.0.2272.118 on Ubuntu 12.04.5. I can't think of any reason offhand why commenting would be different from one thread to another. Can you describe your commenting process a bit more? Do you use the Post Comment button or do you Preview first? I generally type the comment and then post it; I seldom use the preview button since the live preview works well. Thanks. It sure sounds like the form post isn't happening for you but you're advancing to the form-processing page anyway. It sounds like you've ruled out browser add-ons or scripts interfering. Since it's happening in multiple browsers for you it could be something at the system or network level. You might double-check there and see if you've installed any network safety type software. And you could always try enabling secure browsing in your MetaFilter preferences. Having an HTTPS connection might bypass any network help you might be getting. Do you remember, pb, that I had this problem with a specific comment two months ago? Server preview would fail in this manner. Through experimentation, I discovered that there was something within my comment that was causing the form submission to not reach the MeFi server -- I only discovered this after I was able to preview and post in another thread. Then I systematically pared down the comment I'd been working on to isolate the portion of it that was causing the problem. That almost worked, but it turned out to not be so easily restricted. You suggested that something in the pipeline from my browser to the server was filtering out the form submission and, from my experimentation, it was definitely content-based. I ended up just posting my comment from my phone (via cell data or my wifi, so I can't recall if my router was ruled out) and I never pinned down what the problem was. For all I know, it could have been a browser extension or the wifi router or the cable modem or anything else along the way. Or there's a malware sniffer on my PC that's misbehaving (that's not the behavior that they'd want) that I'm not aware of, though probably not. But I worried about it for awhile. I've heard if you try posting your Metafilter password the comment will fail to post. Nope, the comment still posts. Do you remember, pb, that I had this problem with a specific comment two months ago? Yeah, that does ring a bell now that you mention it. If it was a problem with some network filter based on the content of a comment, enabling secure browsing should bypass it. In theory, an HTTPS connection means that the content of your form post is only known to your browser and the MetaFilter server. I wish I'd tried the secure browsing, but I didn't even know about that option in MeFi preferences. This does not mean the cabal has been screening your comments for ideological correctness. Just a simple bug. Looking at that paragraph, possibly the two consecutive dashes were causing something to block the submission as a potential sql injection attack? That's a good guess superna, but no--we don't block potential SQL injection in that way. This feels like a client issue to me, but I'm not sure why the post isn't being sent to the server properly. My thing definitely wasn't at the server, because I was able to post the comment via my phone with no trouble even though it wouldn't post from Chrome on my PC. But, also, looking back the email I sent pb, I see that I naturally also tried IE on my PC and it had the same problem. The one thing I didn't do was try it from another PC. So, not MeFi and not Chrome or IE, but possibly something on my PC or my router or ...? Don't know, it was just weird.